When President John F. Kennedy directed that the United States would land a man on the moon by the end of 1969, he set in motion a search for a launch vehicle capable of doing the job. In the end, two rockets were designed to not only get us there but to test the spacecraft needed. 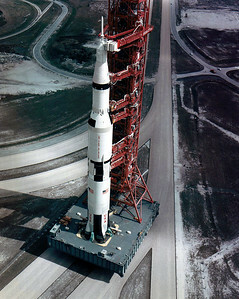 The Saturn I and the final version, the Saturn IB, tested the Command and Service Module (CSM) and the Lunar Module (LM). The Saturn V emerged as the largest manned launcher ever developed, capable of sending 107,000 lbs of payload to trans-lunar injection. Only thirteen flew, the final one sending America's first space station, Skylab, into orbit. Thus far, there has been no successful launch vehicle to rival the Saturn V.
On this website, we seek to provide photographs and details of the remaining Saturn V hardware for the modeling community as well as spaceflight fans. Since 1997, Apollosaturn.com has been providing reference photos and information for students, modelers and others interested in the hardware that took us to the moon. The images here are a combination of NASA imagery and contemporary photos of the remaining hardware. Photos by the author as well as guest contributors are copyrighted by the sources.